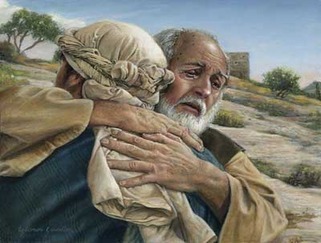 “Lost and Found” is based on the story of the Prodigal Son. The Lost Son is welcomed back by his father. The story is well known. The focus is not only on the rebellious son, who takes and squanders his inheritance and then returns home, but is also on the unconditional love given by the father and the reward of foundation, faith and forgiveness. Sometimes also called the Parable of The Lost Son, some people struggle with the story. It is easy to feel concern for the older, hard working and obedient son who stays behind working his father’s land but is he loved any less by a father so overjoyed to see again the son he thought lost? Originally performed in 2008, Christian Voices are proud to be reviving the play again in 2012. The original cast and production team are listed here.